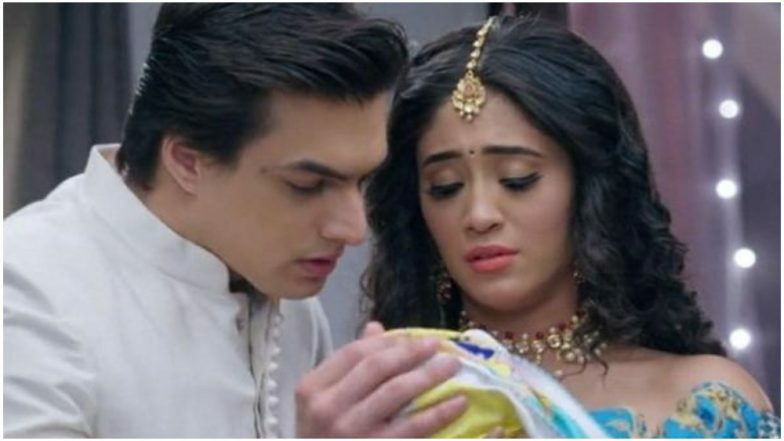 Today’s episode of Yeh Rishta Kya Kehlata Hai starts with Naira (Shivangi Joshi) and Kartik (Mohsin Khan) praying with all the family members and Suhasini giving them blessings. Naira tells them to smile and enjoy as marriage is there in the family and ask if they were so much troubled by her that they directly agreed for marriage and could not wait for some time. Suhasini says that they decided because of the muhurat as holi is also coming and tells all that mehendi function also they will do today only. All go for the preparation. Kartik tells Sorry to Rishab for what he did to him and says that he can do anything for Naira as he loves her very much, Rishab goes from there. Naksh tells Kartik that he and the family think that it is good that Naira does not know the whole truth but he does not think so and says that if this time something wrong happens from his side then he will not leave him and forget all relations. There Suhasini and Kaveri are telling that they are doing this as Naira should not get a doubt that she is already married and even if she asks they will say that as time was less so they did it in a simple manner. Naksh asks Kirti everyone is saying something or other but only she has not told anything. Kirti says that does it matter, what she thinks and that if Naira is happy everyone is happy. As Naira is going Kartik comes and makes fun of her and says she used to like his everything earlier. Naira says sorry as she is unable to remember anything then too she likes his everything and kisses him. (Yeh Rishta Kya Kehlata Hai track is played in the background)They hug each other. Naksh is telling Devyani that he is going to drop Rishab, Naira hears this. There Rishab is restless thinking about Naira and that she will always be Kartik’s and not her’s. Just then Naira comes and asks him where is he going and orders him, till her marriage he cannot go anywhere and goes from there. There Kartik is keeping all old memories in a box which might disturb Naira when she comes to stay with him. Suhasini comes and tells him not to worry and start a new life with new hope and give her so much love that she will just remember that and forget everything that had happened. Luv and Kush also bring the old photos and card which Kartik keeps inside the box but one photo falls down. Surekha comes and tells Suhasini to check the material which she is going to send to Naira’s house, suddenly the envelope falls, the kids gather it and give it to Surekha, the photo which was dropped down also comes with the envelope, Surekha keeps everything in the plate to be sent to Naira’s house. Naira comes down and says that she cannot marry, all are shocked to hear it. Naira says that she will not go as she has to leave Krish and go. All laugh, Naksh says that she can come anytime and if she wants to take Krish with her for some days. Suddenly Kartik comes and says that they will not marry if she does not want but is she sure that she does not want to marry him as he is not good or she does not like him. Naira says that she does not want to leave the house and goes, Kartik says that he will come and stay here. Kartik makes fun of the situation, all laugh at their childish nature. Manish says let us start the rituals. As Surekha keeps the plate which she has brought, Naira’s and Kartik’s marriage photo falls down. Naksh asks Kartik if Naira remembers everything then what will happen. Kartik tells him not to go on saying, again and again, the same thing and enjoy the moment. In the precap, Kirti is telling Kartik that why should she and her kid suffers because of Naira, just then Naira comes there.